Mayyu Ali is a young Rohingya poet, writer, and humanitarian activist who runs the Youth Empowerment Centre in the refugee camp at Cox’s Bazaar. 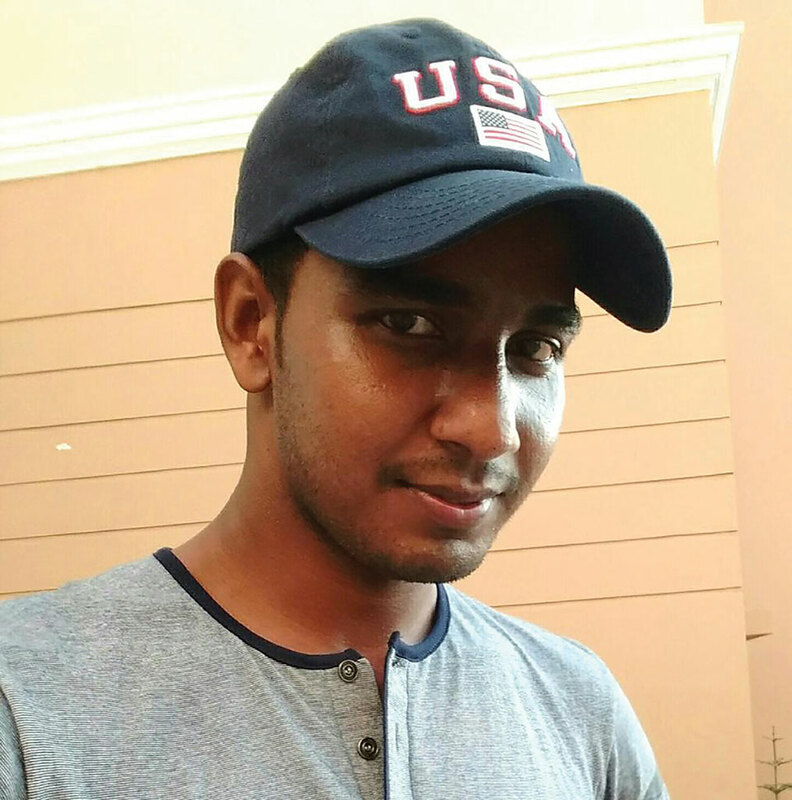 He has written many poems and articles, mostly for rohingyablogger.com. His articles have also featured in Al Jazeera, Dhaka Tribune, and on CNN. Recently he published The Blossom, including some of his early poems, and distributed them around the camps. His poems have appeared in Modern Poetry in Translation (special feature on Rohingya poetry) as well as the Best English and Light of English magazines in Myanmar. His poems will appear in a pamphlet of Rohingya poetry and folk songs published by Arc Publications in July 2019. Our interview was conducted over email. 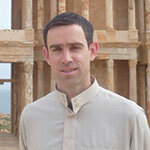 James Byrne: You currently live in one of the largest refugee camps in the world. The Tatmadaw (Burmese) army is on one side of the camps, the Bangladeshi army on the other. What is it like to write and to live in a place like this? Mayyu Ali: The Naf River separates Myanmar and Bangladesh. The water of the Naf flows through creeks into Myanmar. Being an exiled Rohingya from Myanmar in Bangladesh’s refugee camp, I can still breathe the air of my motherland when it flies through the sky. And I can see the green forest in Arakan that seems to want me to embrace it. Thus, it always helps me to maintain the national spirit in my blood for Myanmar, my country. On the other hand, it often increases the yearning for my beloved motherland. On the Myanmar side, the Burmese Tatmadaw are still committing human rights abuses against Rohingyas living inside. In Bangladesh, where the army has been providing refuge for more than one million Rohingya who have escaped the killings in Myanmar, I am just one among many. Surviving in a place like this is like living in two different worlds at the same time. One place is the cruelty of inhumanity in Myanmar. Another is the safety of humanity in Bangladesh. Writing about being a Rohingya in such a situation is a battle between trying to survive and raising the voices of people who are counted as forgotten in the world. Byrne: The refugee camp at Cox’s Bazaar was originally created by Captain Cox in 1799, who asked for “wastelands” near the Baw Calli River around Ramoo. You write in English. How far is your decision to write poetry in English a response to colonial oppression, and how difficult has it been for the Rohingya to create their own poetry in the Rohingya language? Ali: Rohingyas were kings in Arakan. The Rohingya language was used in Arakan courts. Historical evidence, like stone inscriptions and coins, tells that the Rohingya are a bona fide ethnic group of people who have been living for centuries in Arakan. Moreover, they belonged to a distinct culture, tongue, and scripture. During the Rakhine dynasties, there were aggressions and wars. Decades later, Myanmar was under colonial oppression for more than one hundred years. On January 4, 1948, Myanmar got its independence. Since 1960, the country has been administered by military juntas. During colonialism, people lost touch with their own culture and tradition. And during the administrations under military juntas, people, especially Rohingya, lost the long existence and national identification for which they have been targeted. Thus, the moment I was born to a Rohingya parent in Myanmar followed decades-long state-sponsored persecutions. I learned the Rohingya language without its particular written form (which is two hundred years old and uses a version of Arabic script). While learning Rohingya as a language, I found that the culture and literature of my people have been eliminated because they are socially targeted. The experiences in my life have taught me to write in English rather than in Burmese, because I want people from all over the world to understand why my people have been discriminated against for decades. And yet Rohingya still belongs to the culture that my grandfather knew. He would often sing me to sleep with the songs and poetries written in our dialect. Unfortunately, today, we have lost our language. Byrne: Your poems are what I would call tough, direct, activist. Recently we’ve been talking about ways of writing poems that document what you can see. How difficult is this given your apparent desire to share the Rohingya experience with the outside world? How might activism and imagism operate together in a poem for you? Ali: As mentioned, as I grew older in western Myanmar, I encountered a world where every human right was denied to us. I learned how we (Rohingya) were marginalized and discriminated against religiously, socially, and politically. Despite this, I managed to receive an education at a government-run school in a rural area. In 2008 I passed my matriculation—the exams needed to enter university. In 2012 anti-Muslim riots spread across Rakhine State. After this, hundreds of Rohingya students were banned from attending Sittway University. I finished my first and second years for an “English Specialization” at the university. But since the violence broke out in 2012, I was prevented from attending to continue my studies. Being a Rohingya in Rakhine State, access to reading good books or popular magazines is rare. Our movement is severely restricted even from one township to another. At an early age, life taught me to take on the role of writing poems and articles that speak to the pain and despair of my people. Thus, writing became a passion in my blood. Writing for Rohingya people is activism. For me, being a Rohingya, victims of a slow-burning genocide in Myanmar, imagism is far from activism. Byrne: Which poets did you have access to as a Rohingya poet when you were living in Myanmar? Did movements like Khitsan (“testing the times”) and Khitpor (“modern poetry”) matter to you, as they did to Burmese poets? Ali: No Rohingya is officially considered a writer or poet. So, it is not easy to access sources of inspiration while I am marginalized. I just know some of the poets I read in school curricula, like Shakespeare, Longfellow, Christina Rossetti, etc. . . . But no one I had real access to. In 2008, when I passed my matriculation, I discovered the Best English and Light of English magazines in Myanmar. I sent poems, and, over time, sixteen were published. These magazines were published every month. When the anti-Muslim riot broke out in 2012 in Rakhine State, accessing or buying magazines from downtown and posting and submitting poems through the post office was restricted. I have lost touch with the magazines that I enjoyed so much. For me, movements like both Khitsan and Khitpor existed at the same time as being a Rohingya poet confronted me with the heart of Myanmar’s genocide. Byrne: Before you arrived at the refugee camp in Cox’s this time, you had witnessed many traumatic experiences in Rakhine State. In the last few years, you’ve developed into one of the leading new Rohingya humanitarian workers, someone who recently set up the Rohingya Youth Empowerment Centre in the camps, educating the Rohingya from within, resisting the often-vested interests of NGOs. How were your experiences in Myanmar important to the humanitarian aid work you are doing now? And can you tell us a little more about the YEC? Ali: For decades, Rohingya are severely restricted in access to health care, education, movement, social activities, etc. Rohingya are Myanmar’s most vulnerable community and Myanmar’s western Rakhine State, where Rohingya have been living for generations, is the country’s second poorest. It is one of the world’s most isolated zones for humanitarian aid. Myanmar is to blame for persecuting my community and leaving us extremely vulnerable. 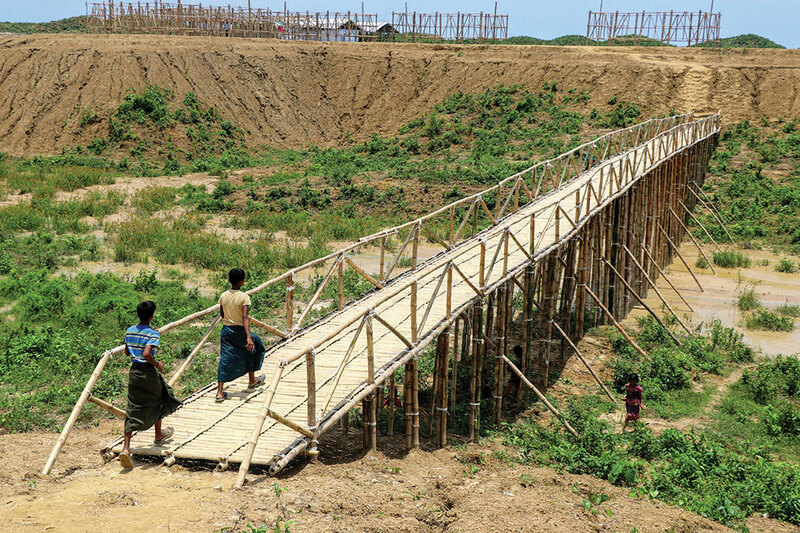 Despite these crimes, the Myanmar government often stops humanitarian aid and restricts NGOs and agencies from intervening their activities in Rakhine State. Northern Rakhine State’s maternal mortality rate is double that of Myanmar’s national average, which, at two hundred deaths per one hundred thousand live births, is already one of Asia’s worst. In Buthidaung and Maungdaw, malnutrition rates rival those of war-torn regions in sub-Saharan Africa. Since I was stopped from going to Sittway University in 2012, I joined Action Contre la Faim (ACF), a French-based NGO working against malnutrition in Rakhine State. I was working for ACF at the time my village was burned down, and we were forced to flee Bangladesh during the killing on August 25, 2017. I continue to experience, as I did then, how humanitarian work is crucial for Rohingya communities to survive. As you mentioned, last year in Balukhali camp at Cox’s Bazaar, I founded the Youth Empowerment Centre (YEC). We conduct workshops that focus on rebuilding lives and providing capacity building or training to Rohingya youth, especially for building peace and harmony, leadership, management, and creative thinking. We believe that an empowered youth is a great pillar on which to rebuild the community. We conduct workshops that focus on rebuilding lives and providing capacity building or training to Rohingya youth, especially for building peace and harmony, leadership, management, and creative thinking. Byrne: We’ve recently put together a collage poem of Rohingya voices. 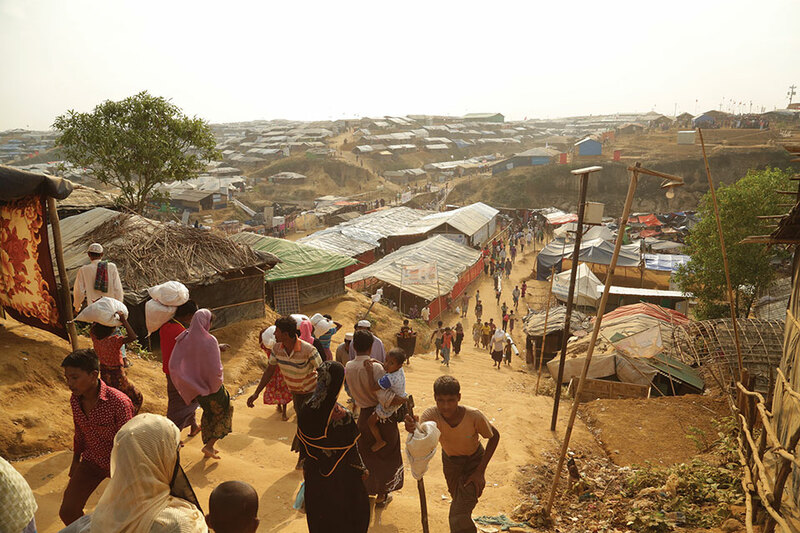 How is the Rohingya voice able to mobilize, living in the camps? With daily survival the main priority, are artists able to make responses to the experiences they are living through? If not, what could change to make this happen? Ali: Here in the camps, everyone struggles, looking to survive each day. We need everything here. For Rohingya who have been seeking peace and justice, daily life lets them know what the greatest concerns are. There are Rohingya parents who want formal education for their kids. There are Rohingya youth who want to rebuild lives in the community. There are students who want to continue their studies. On social media like Facebook, Rohingya youth have been trying hard, writing poems and articles for people. They want to be the voice for their people. They want to change lives. They have the same dreams as others in the world. When I requested my friends and colleagues to share their “collective voices,” they were excited. They wanted their voices to be heard. They wanted their pain to be recognized. I encouraged them and helped with translation. Finally, it happened. Now, they are all excited to read their voices in magazines and elsewhere. Byrne: In the first poem I ever read of yours, “That’s Me, a Rohingya,” I remember the stanza: “Even when I watch the sunrise, / I’m not living like you are. / Without the fertility of hope I live, / Just like a sandcastle.” It struck me quickly that, far from being “hopeless,” your poems read like powerfully active survival mantras. But how, for the Rohingya, can hope genuinely find a way? Ali: Since we were recently politically targeted in Myanmar, we had hopes that Aung San Suu Kyi would help us. She was our hero when we lived in the country. When she came to power, winning a landslide victory in the 2015 election, she turned a blind eye and now does not care about the Rohingya situation in Myanmar. Soon after this, the world’s fastest exodus of Rohingya happened in August 2017 under her administration. She is a leader and has moral authority for her country’s minority Rohingya people. But she has failed. And Rohingya lost their last hope. On the other hand, what the international community has been doing is not enough. And justice for Rohingya who are mostly living in the diaspora, in several neighboring countries, remains elusive. If we don’t have this support from Myanmar or the international community, we have to find hope within ourselves. One of the most important interventions for Rohingya to find a way is to rebuild a life from inside themselves, doing what they can with what they have where they live. To make this happen, Rohingya leaders who live overseas should take more responsibility and prioritize these rebuilding activities. Every Rohingya should take part in leading the community to be civilized. When I am being a Rohingya, referred to as the world’s most persecuted person, I feel like I am pushed to be the world’s most hardworking person. This passion circulates now inside me from vein to vein. Byrne: The false promise of repatriation in October was resisted by Rohingya at the end of last year. For you, what is the best way out of the camps? Where do you want to be? The Myanmar government should ensure safe repatriation and proper rehabilitation for us. Historically, geographically, ancestrally, we belong there. Ali: I want to go back home. Myanmar is my motherland. We had been living there for generations. The Myanmar government should ensure safe repatriation and proper rehabilitation for us. Historically, geographically, ancestrally, we belong there. In a decade, we have fled and returned many times. Every Rohingya wishes to go back to their homeland in a safe, dignified, and voluntary way. We want peace and justice first. Perpetrators of the violence should be held accountable. The Myanmar government should restore citizenship rights to the Rohingya population. The international community should stand firmly until Rohingya enjoy the same rights as other ethnic groups in Myanmar. Read “Rohingya: Collective Voices,” a collection of poems composed during workshops at the Youth Empowerment Centre, which appears in this same issue. Read "A Rohingya Refugee,” by Mayyu Ali.